In this guide we’ll take a look at the best rotary washing lines. What Is The Best Rotary Washing Line? The Brabantia Lift-O-Matic Rotary Airer Washing Line is the best heavy duty rotary washing line because of the excellent build quality and large drying capacity which provides over 50 metres of washing line. The rotary washing line also has a low setting so you can dry woollens or air cushions flat on top. There are holes at the end of each arm which will securely hold hangers so you can dry delicate items with ease. The product is adjustable to suit your height and is light and exceptionally easy to open and close. The arms spin smoothly allowing the washing to catch the breeze and dry faster. The washing line also comes with a solid and durable 45 cm soil spike to secure it into the ground as well as a cover, peg bag and pegs. Overall this is the best heavy duty rotary washing line for families and the fantastic build quality means it will last for years. The Premium quality 40 metre Rotary Washing Line has a 40mm stainless steel centre pole, a 40 metre drying capacity and is easy to open and close as well as adjust to a range of heights. You can also adjust the tension on the line very easily and the whole thing spins smoothly. The rotary line also has indents which allow you to hang coat hangers securely at the end of each arm for drying delicates without leaving peg marks. The line also comes with a sturdy cover to keep it clean and dry when not in use. Overall, this is a sturdy product that is easy to use and is the best rotary washing line for small families. The Premium 30 metre Rotary Washing Line Kit is a neat and compact washing line has a capacity of 30 metres yet takes up hardly any room to use and store. The centre pole is constructed from 35mm steel and the arms are strong and well made. It comes with a metal ground spike to secure it into your lawn as well as a good quality cover to keep it clean and dry. The dryer is adjustable to a range of heights and has 4 tension settings that are also easy to adjust. Overall, this is the best rotary washing line for couples or anyone with a small garden as it easily holds a full wash but takes up very little space. The Addis 40 m 4-Arm Rotary Airer is great value for money offering 40 metres of drying space in a compact and sturdy rotary washing line. The fully painted steel construction makes this line weather proof and resistant to rust. The line comes with a 32 mm metal socket with which to secure it into the ground. The washing line is easy to open and close and adjusts to a range of heights. There are hooks at the end of each to arm to secure hangers when drying delicates. Overall this is the best rotary washing line for a family on a budget. The LIVIVO Outdoor Garden 4 Arm 45m Folding Rotary Washing Line has a capacity of an impressive 45 metres, plenty for a couple of loads of washing. It is reasonably sturdy as well as being light and easy to put away when not in use. The rotary line comes with a ground socket as well as a cover and is powder coated to make it weather resistant. The build quality is impressive for the price. Overall, this is the best rotary washing line if you are looking for something low cost but have a couple of loads of washing each day. When choosing the best rotary washing line look for one that is well built from good quality materials. 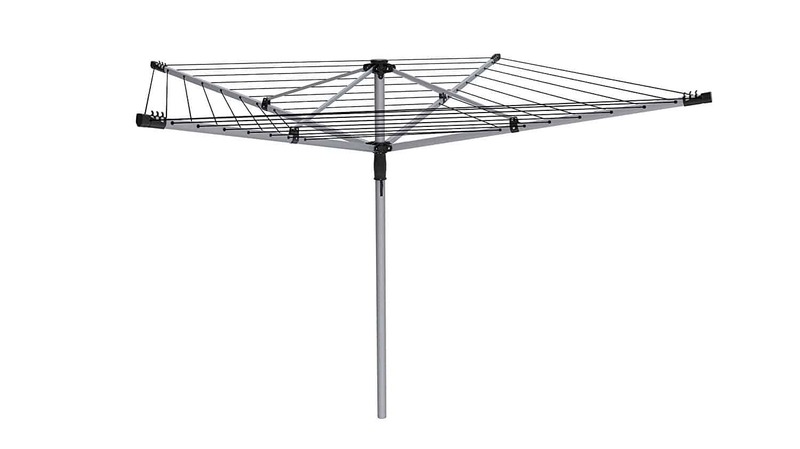 This will make sure it is sturdy enough to withstand windy weather, so your washing won’t end up on the ground! Most rotary driers are adjustable to a range of heights and will suit most people. However, if you are tall, you might find some of the smaller driers uncomfortable to use so do check the height before you buy. Look for a line that spins effortlessly as this will help your washing to catch the breeze and dry more quickly. Many rotary washing lines also have adjustable tension, so you can tighten or loosen the lines as required. Rotary washing lines are usually easy to put up and down, but some are lighter and smoother than others. You will need to install a ground socket to hold your dryer. These can either be positioned directly into the soil or concreted in. Most rotary driers are made of either aluminium or painted or powder coated steel which makes them resistant to the weather. It is wise to close and cover the dryer when not in use to keep it clean and dry. Ideally, you should put the whole drier away in very bad weather to protect it from strong winds. How do I install a rotary washing line? Setting up your rotary washing line is a simple matter of fitting the centre pole into the ground socket and then pressing a button and pushing up the arms of the dryer before releasing the button to secure the arms at the required height. It’s just like opening an umbrella! My rotary washing line has gone a bit saggy. How do I tighten it? Rotary drier lines can sometimes stretch over time as a result of UV damage and the weight of heavy washing. However, it is easy to tighten the line. Start by setting the rotary line at a low position. Starting at the centre of the line, pull each section until it is reasonably tight. Do not overtighten otherwise you will not be able to close the drier. Once you have got each section even you can put the rotary drier into the higher position. You may need to tie off and remove a section of excess washing line at the end, however before you do this, ensure that the line will easily open and close. The line on my rotary washing drier has broken. Can I restring it? Yes, it’s quite easy to restring a rotary washing line. You will need some patience and a couple of hours, but it is simple to do and requires no special tools. Ascertain how much washing line you will need by measuring one section and multiplying by three or four depending on how may arms your drier has. Then add a little bit extra for threading and tying. Buy a good quality washing line of the same diameter as the previous line. Have a good look at the current line to see how it is threaded and tied – taking a few pictures at this stage can be very helpful – then remove the old line. To restring the line, start with the middle threading the new cord in the same way as the old one and tying off to finish. You can do this in two sections if necessary, tying off after the first section and then beginning again. How do I fix my rotary washing line into the ground? Rotary clothes driers come with a socket that you fix into the ground, these are usually called lawn spikes or sockets. This socket can either be positioned directly into the lawn or concreted in. To fix the lawn spike into the ground simply position it in the required location then place a piece of wood on top to protect the spike while you bang it into the ground with a mallet or hammer. Keep checking that it is level as you progress and adjust as necessary. To fix a spike into concrete you will need to dig a hole approximately a spade width wide and as deep as your ground socket. Place the socket in the hole and pour in a bag of dry post concrete while holding the spike upright. Then, check that the socket is level with a spirit level, and add water to the concrete according to the instructions on the bag. Keep holding and checking the socket is level until the concrete is dry which will take five or ten minutes depending on the weather conditions.